Who does not love an all-rounder performance in a cricket match or in any other game! It is always delightful to see a single individual performing in all areas. If you ever enjoyed all-rounder performance then it is time to enjoy an all-rounder offer. Yes, you hear it right! 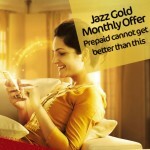 Jazz has introduced an exciting weekly offer that has all benefits in it and named it Haftawaar all-rounder bundle. As its name suggests, the Haftawaar offer is a hybrid bundle that will give you unlimited incentives including minutes, messages and internet data at the reasonable price. Unfortunately, the offer is not available in selective cities. If you want to know more about the offer, following detail will help you out. With Jazz Haftawaar all-rounder offer, you will be able to get unlimited on-net plus off-net minutes, free SMS and mobile data for the whole week at just Rs 84 including taxes. Only setup charges will apply to each new call. 700 on-net minutes which allow you to call at any Jazz number. 50 off-net minutes for your calls on other networks as well. 700 SMS for your nonstop chats on all local networks of Pakistan. 250 Mbs of mobile data for continuous access the internet for a week. To get the load of free talk time, free SMS and unlimited data Mbs, you have to subscribe to Jazz Haftawaar all-rounder offer by dialing *747# from your prepaid connection. On successful activation, you will receive a confirmation message from the company. 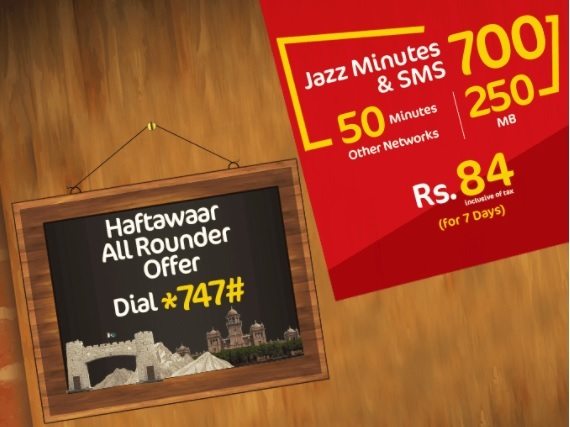 Haftawaar all-rounder offer is valid only for prepaid subscribers of Jazz. Offer is valid for a whole week as it is a Haftawaar offer. Offer is available for whole North except Rawalpindi and Islamabad cities and cities of Baluchistan Province including Khuzdar, Gawadar, Pishin, Jaffarabad, Quetta, Zhob, Ziarat and other cities. Call setup charges of Rs 0.15 including all taxes will apply on the first minutes of the new call. On over usage of mobile data, you will be charged as Rs 1 per Mb. Service charges, operational fees, and FED taxes will apply to all usages according to your region. In Islamabad, Gilgit Baltistan, FATA and AJK 21.4% higher price will be charged. 5% withholding tax will apply to using all services. If you are not subscribed to any packages than base rates will apply. Moreover, the offer is available for the only limited time period. Offer can be changed or withdrawn any time as Jazz reserves all rights. Terms and conditions will apply as per company rules. Jazz has outclassed its competitors with its all-rounder performance. It has given its customers all benefits in a single offer and ensures that you will get all the incentives at low rates. So, don’t miss your chance of getting all benefits with Jazz all-rounder offers.